This Pyramid, consists of 91 Pyramids in total. 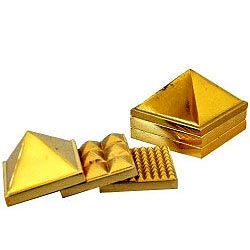 Highly efficient in correction of Vastu defects and creation of positive energy, this Pyramid is made of three layers of high quality brass. As you can see in the picture, there is a single large Pyramid On the top layer. At the second level, there is a plate of nine medium sized pyramids and on the last level, there is a layer of 81 Pyramids. In this way, there are 91 pyramids in all, at three levels. Our Metallic Pyramids are of very high quality costly Brass, so they do not easily get rust or disintegrate, even after burying for many years, for neutralizing Vastu defects"